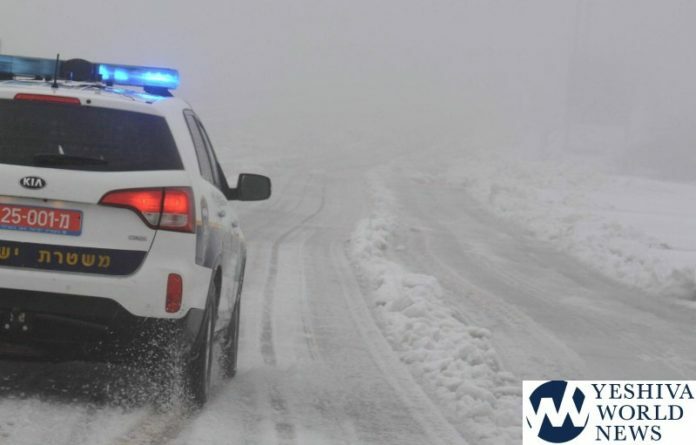 The Jerusalem Municipality has been sending out notices via different media to residents and the general public regarding snow accumulations, and while the weather service does now show temperatures dropping below freezing in the capital any night this week, there is still talk of snow accumulating. Jerusalem Municipality officials inform the public it can use the 106 operator for emergencies, as well as the smartphone app, Facebook page and the city’s website. Jerusalem Mayor Moshe Leon has announced that schools will close at 3:00PM on Wednesday in light of the predicted storm. This includes public schools, kindergartens, daycare centers and afternoon programs, social service programs and special ed facilities. The mayor explains in light of the predicted snowstorm, he does not want to place the well-being of the children in danger and ending early will permit everyone to get home in a timely fashion, and to avoid traffic snarls before 5:00PM, when the sun sets. In the accompanying video, we see Mayor Leon speaking about the storm, with the snow plow tractors parked in the background. With forecasters predicting snow accumulations in the capital on Wednesday, CityPass calls on drivers not to leave vehicles along the tracks in order not to block the train route. In the past, on snow days, cars were abandoned on the tracks of the light rail and as a result the trains could not move, causing snow to accumulate along the line and preventing the train from continuing. As part of the preparations for the snow, it was agreed that the municipality would allocate a tow truck for the evacuation of vehicles stuck on the tracks. In order to prevent the passenger trains from being used as snow plows, which could damage the trains themselves, CityPass has already purchased snow removal equipment, including snow removal pans, a heating mechanism for the track boxes, a mechanism that prevents the crystallization of ice on electricity cables and more. CityPass reminds the public that the light rail is adapted to snow conditions of up to 5 cm (2 inches) only. If a heavier snow is placed on the tracks, the service will be stopped and renewed as soon as possible. CityPass recommends that the passengers use the CityPass website to remain updated, as well as the city’s emergency site and Jerusalem Municipality call center. The light rail operator adds, “CityPass and the Jerusalem Municipality have held extensive and ongoing cooperation and have held joint meetings with the relevant bodies in order to prepare for the storm. Among other things, the issue of clearing the snow is coordinated by municipal teams in the area of the light rail route, including the evacuation of junctions and tracks of stranded vehicles, the evacuation of the Cords Bridge and the access roads to the stations. In addition, preliminary work was carried out and preparations were made for pruning trees and neutralizing damage to the railway route. Rebbitzen Goldenpickanicerscreenname on Difference between Chabad and everyone else?